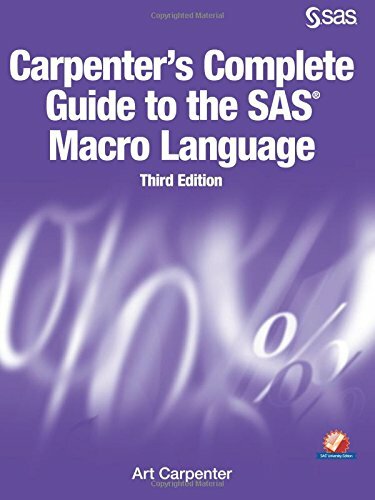 For SAS programmers or analysts who need to generalize their programs or improve programming efficiency, Art Carpenter thoroughly updates his highly successful second edition of Carpenter's Complete Guide to the SAS Macro Language with an extensive collection of new macro language techniques and examples. Addressing the composition and operation of the SAS macro facility and the SAS macro language, this third edition offers nearly 400 ready-to-use macros, macro functions, and macro tools that enable you to convert SAS code to macros, define macro variables, and more! Users with a basic understanding of Base SAS who are new to the SAS macro language will find more detail, utilities, and references to additional learning opportunities; advanced macro language programmers who need help with data-driven macros and dynamic application development will find greatly expanded treatment of these topics. Far beyond a reference manual issued from an “ivory tower,” this book is pragmatic and example-driven: Yes, you will find syntax examples; yes, the code is explained. But the focus of this book is on actual code used to solve real-world business problems. In fact, an entire appendix is dedicated to listing the nearly 70 classes of problems that are solved by programs covered in this edition. Discussion of the examples elucidates the pros and cons of the particular solution and often suggests alternative approaches. Therefore, this book provides you both a compendium of reusable and adaptable code, and opportunities for deepening your understanding and growing as a SAS programmer. If you have any questions about this product by SAS Institute, contact us by completing and submitting the form below. If you are looking for a specif part number, please include it with your message.